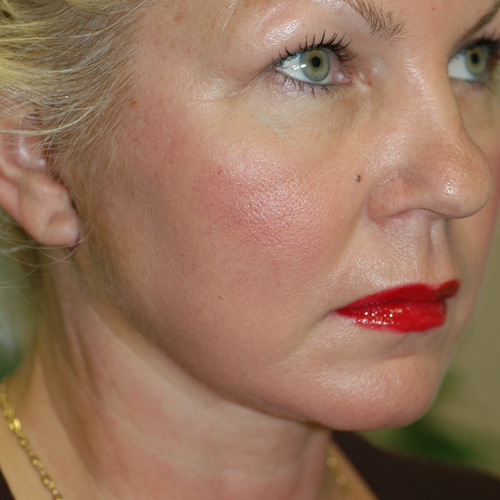 This very busy 51 year old professional woman was looking for a more symmetric and rejuvenated look. 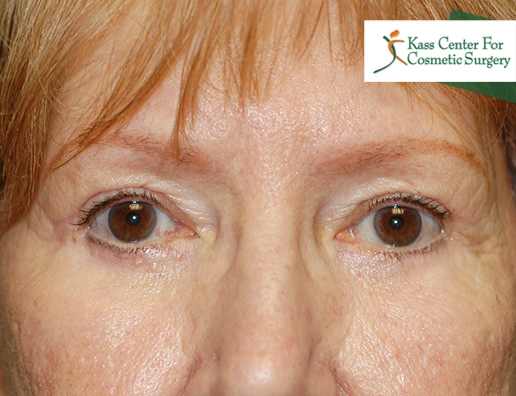 She asked for upper and lower eyelid surgery and also wanted a Weekend Lift at the same time. These pictures are taken just one week after her surgery and you can notice a small bruise which remains below her left eye which disappeared over the next few days. To best assess the results of the Weekend Lift, it is important to view her from the side. 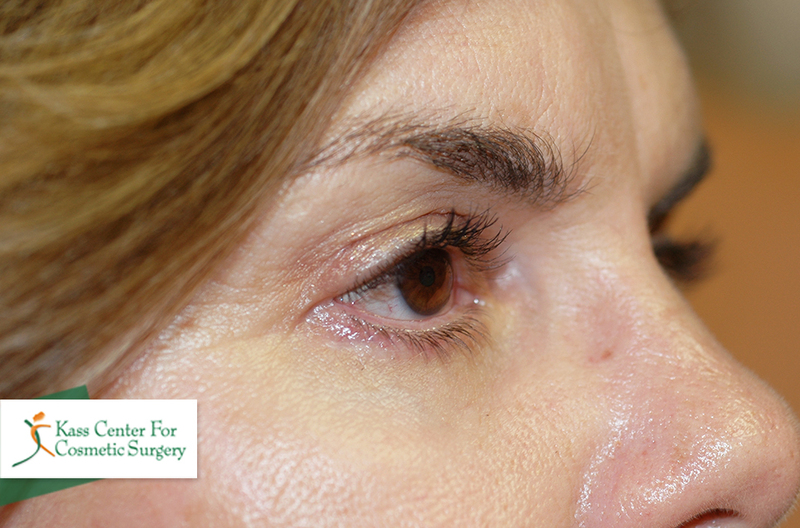 But to best assess the results of her eyelid surgery, it is best to view her straight ahead. 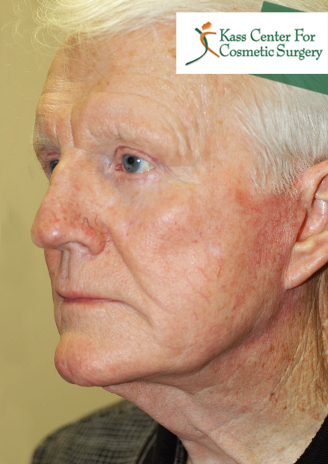 Please check the photos of this patient in both places. 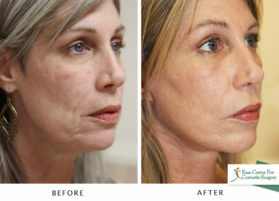 As you can clearly see, her results at one week are amazing! She is one of the sweetest patients we have had at the Kass Center, and each year when she returns for a filler injection, it makes us smile to see how wonderful the surgery Dr. Kass did is still holding, now more than ten years later. This 66-year old woman saved her money to give herself a gift – a Weekend Lift. She was a diligent patient when managing her post-op recovery, and it shows. The “After” photo is just one week after her Weekend Lift! Astonishing! Watch the video testimonial here! 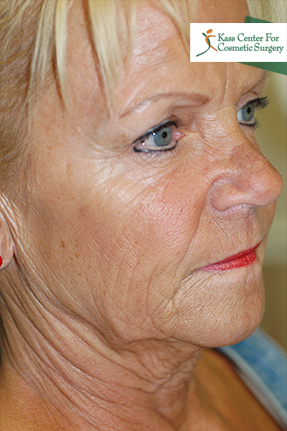 This 56-year-old woman was unhappy with the lines on her cheek and above her upper lip, the thinness of her upper lip, her under-eye bags, droopy eyebrows, lines on her forehead and the bands in her neck. 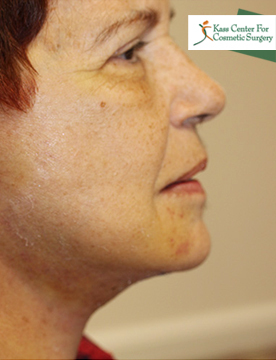 She underwent laser treatments to her upper lip and Thermage by another doctor and was disappointed that she saw no improvement with either treatment. She was ecstatic with her results from Dr.Kass. Every single one of her concerns was addressed, improved, and corrected. What do you think about the results? 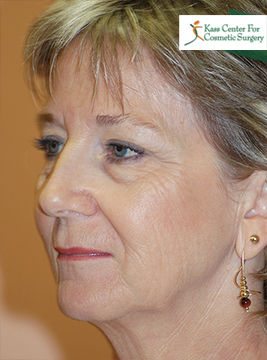 This 53-year-old woman hated the sad face which greeted her in the mirror each morning. 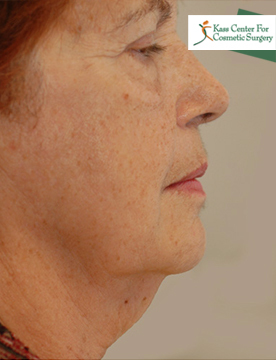 She was most unhappy with her jowls, the loss of her jaw line, the down turning of the corner of her mouth, the bands in her neck, and the appearance of her skin. 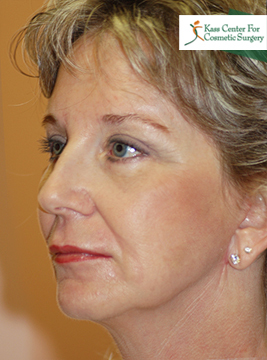 She also wasn’t happy about her eyelids but, like many patients, did not want to do everything at the same time. 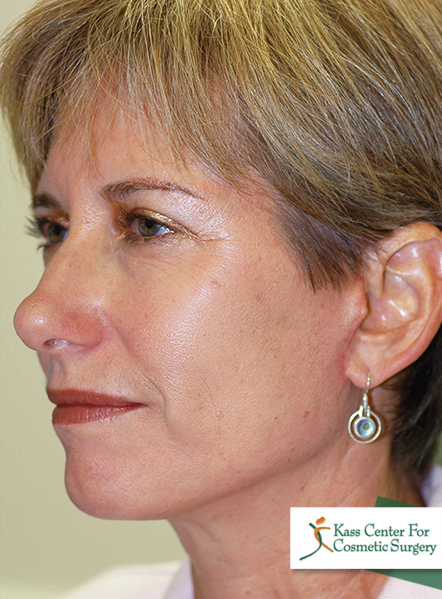 This patient was thrilled with her results. It took years off of her appearance. Don’t you agree? She is so happy she can’t wait to go ahead with eyelid surgery and is planning for it now. This very sweet 54 year old Professor of Nursing (and a doctor’s wife) came to see Dr. Kass. 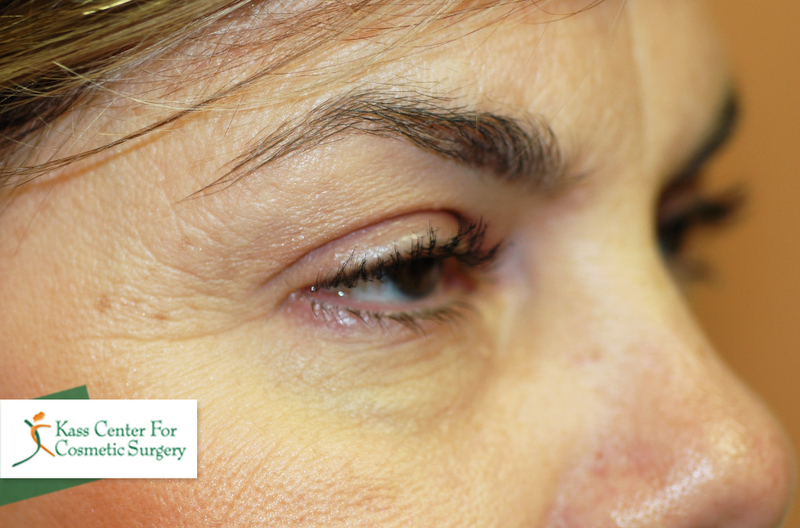 She was particularly unhappy with eyelid scarring which developed after her dermatologist removed a benign skin lesion near her eye. 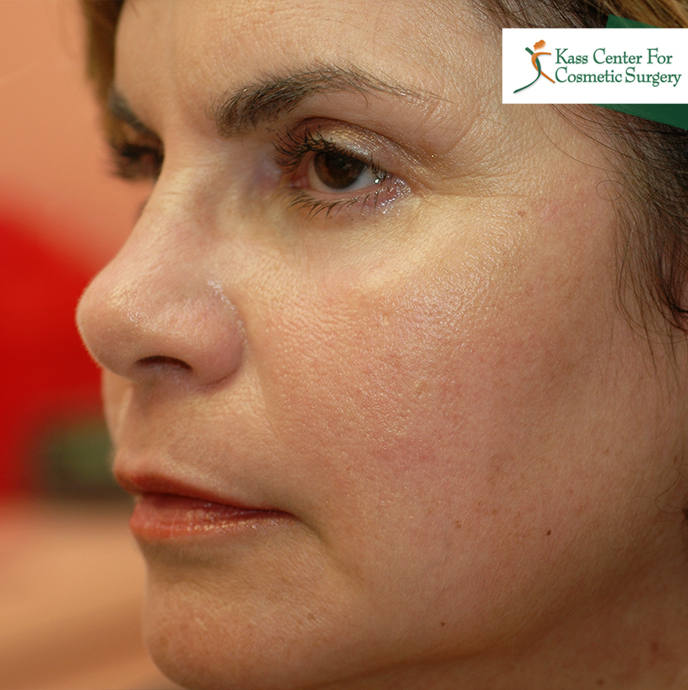 After seeing examples of Dr. Kass’ work, she decided that she also wanted to fix her droopy eyelids and sagging face. She wanted to feel as young as she felt, and also wanted back the confidence she had when she first started teaching. 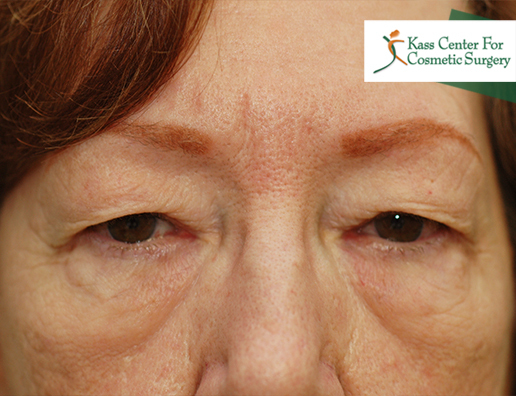 She elected to have scar revision of her right upper and lower eyelids, bilateral upper and lower eyelid blepharoplasties, with a Weekend Lift. 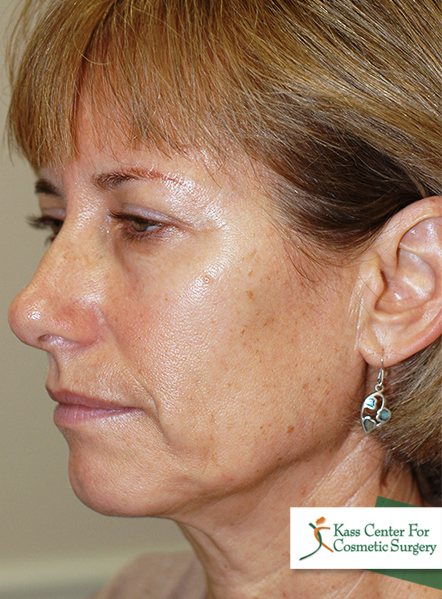 This patient has healed wonderfully and stated at her last visit that she only wished she had made this decision sooner. This is a 71-year-old man who is working as a business consultant. He believes that his “tired” appearance may be hurting him as he loses clients to more youthful-looking competitors. He does not mind looking his age and he is not trying to look like a movie star. He wants to look more vigorous and less tired. 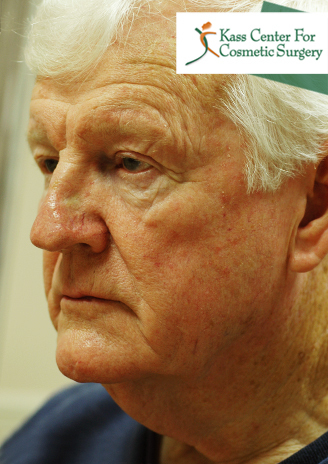 He was so grateful that the first person he referred to Dr. Kass after his recovery was his wife! 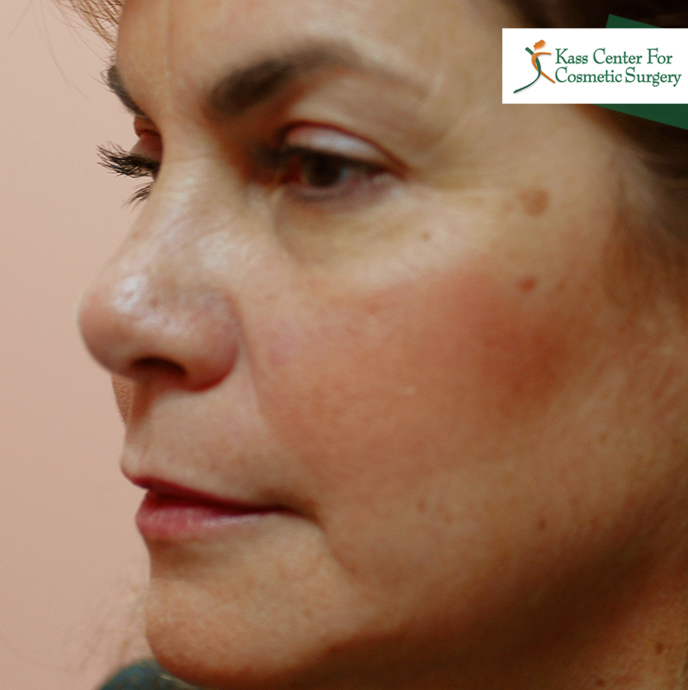 This 63-year-old woman was referred to Dr. Kass by her husband. 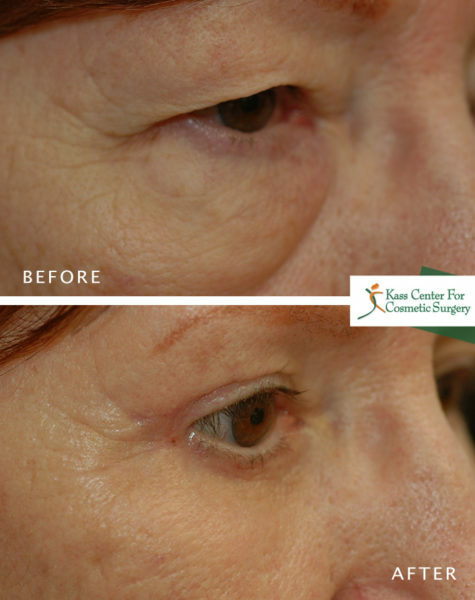 She had previously had surgery on her upper eyelids by another surgeon and was requesting only surgery on her lower eyelids. Needless to say, she was ecstatic with her results! 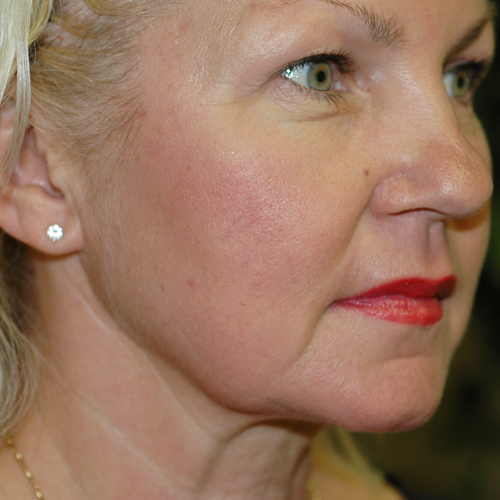 This patient recently divorced, beautiful, 44 year old lady came to Dr. Kass because she was horrified about how her neck looked. She claimed that her neck looked like a gobbler neck on a turkey! She could not see how beautiful her face was because all she saw was her neck. 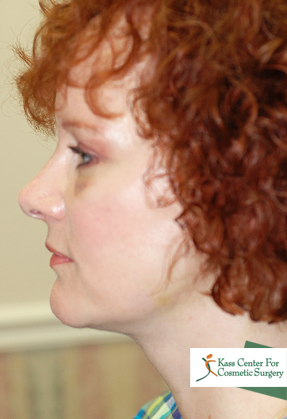 She quickly booked a neck lift procedure and has never looked back. 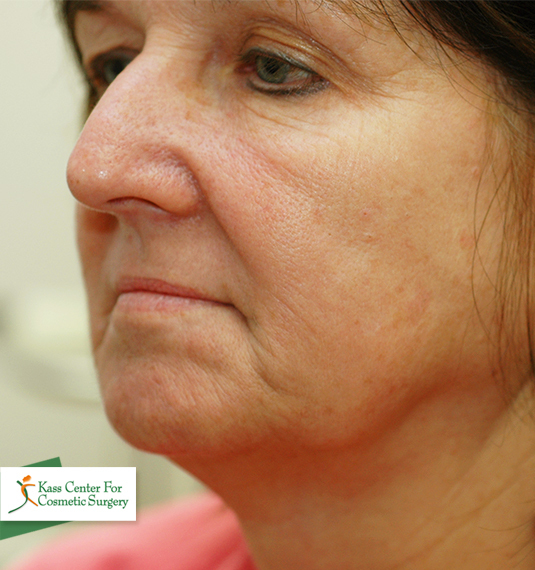 She had minimal bruising and swelling, and healed spectacularly. 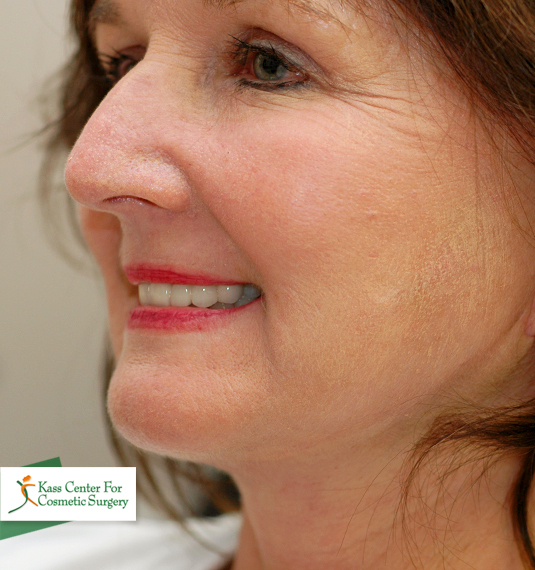 Many times she told Dr. Kass that having surgery with him was the best decision she ever made! This 65 year old woman, about to retire, wanted to look her very best as she began the new activities of her retirement. Initially, she presented for just upper eyelid surgery. 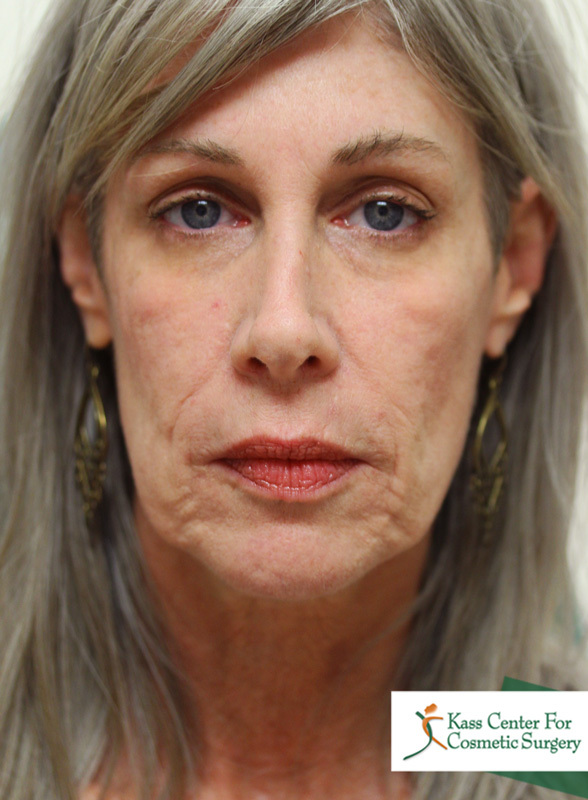 But she was so delighted with her results that, after just one week, she decided that she also wanted lower eyelid surgery (blepharoplasty), festoon treatment with localized Hetter Facial Resurfacing, and bilateral midface lifts. Here she is at just a couple of months after surgery. And there will be even greater improvement as she continues to heal! She says she is constantly getting complimented about her eyes, and that now she faces her retirement activities with renewed vigor and self-confidence. In fact, she is even thinking about what she wants Dr. Kass to do next for her! 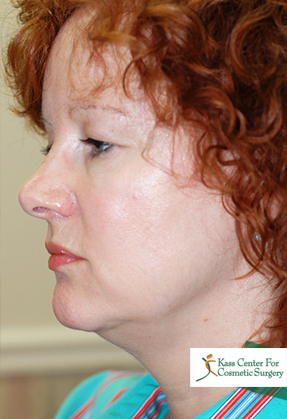 This 43-year-old woman was concerned about the drooping of her upper lids, loss of definition of her cheeks, and she “hated” the bags under her eyes. But even more than these, she hated the bags of her cheeks, called festoons, or cheek bags or malar mounds. 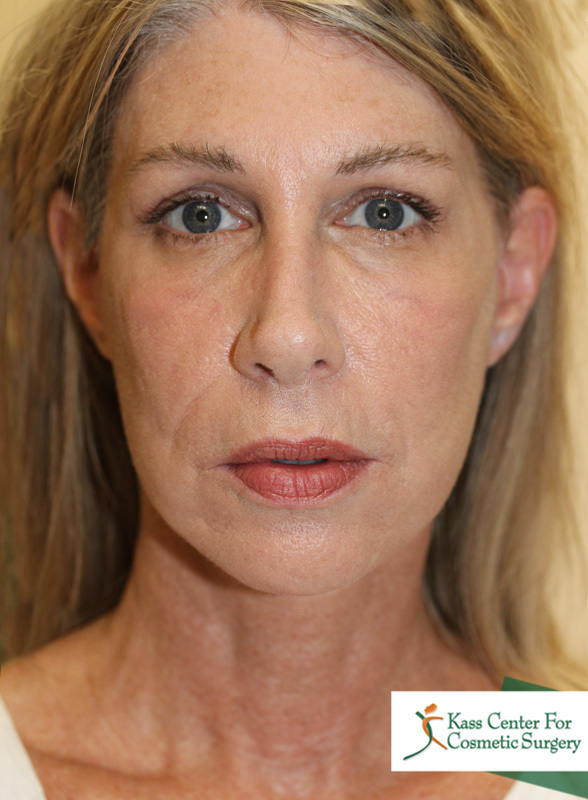 For her, Dr. Kass performed his unique bilateral resurfacing of the festoons, mid face lifts, bilateral upper and lower eyelid lifts, bilateral eyelid ptosis repairs, and a full-face Hetter resurfacing chemical peel procedure.